Today we are going to take a look at how to use target orders as part of an almost “all in” strategy whilst sending stop losses (or take profits) with the correct size. It might sound simple enough on paper but, when sizing positions, there are a few options available to us. If you go down the wrong route, you can be left scratching your head. Why do we say almost “all in”? Well, going “all In” is not as simple as dividing our available cash by the current price when we send our orders. 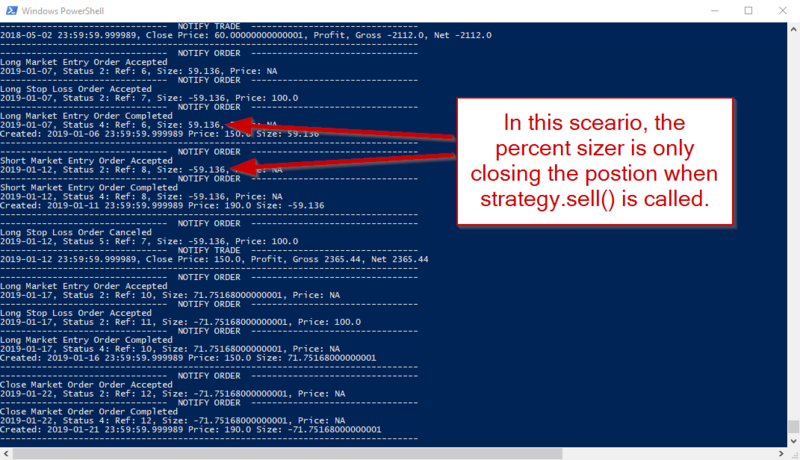 Unless we use Backtraders cheat on open functionality, our size is calculated using the close price of our data feed. However, our entry price will actually be determined at the open of the following bar. During this time, price could easily gap up/down leaving you without enough cash to complete the trade. As such we, we will not try and go all in with 100% of our cash. Instead, we will reserve a small amount to account for gapping. In my opinion, this is a good habit for when we progress to the real world as price is always bouncing around and it is impossible to know where the price will be by the time your order is filled by the broker. Gapping is not the only trading hurdle we must jump over to meet the objectives of this post. Reversing a position will require a completely different size to opening a position from flat. When we are reversing positions, we are required to submit enough size to close the position and then further size to go “all In” in the opposite direction. Backtrader will not do this for you if you simply use self.buy()orself.sell(). Fortunately, though, Backtrader does have a tool for the job which we will look at in a bit. Another challenge we will face is that if we do reverse a position and want to create a stop loss or take profit, we need to ensure that our stop loss or take profit size is not the same as the reversed position size. That would be too large. The stop and profit orders must exit a position and not reverse it again. From Jan 1st to May 1st, price will nicely rise and fall every 10 bars in even steps. Following this, from May 1st 2018 price will be offset by $50 and start gapping by $10 at the open. On 28th September price will revert to normal. We will start with a simple base strategy and build on it throughout the examples. The strategy has been tailored to the test data and simply takes action on certain dates. This allows us to know ahead of time what should happen. In other words, it will allow us to focus on Backtrader’s mechanics. # Is now net short. So we now have a base strategy for buying and selling with a size of 1 every time. It is time to move onto the next objective and try to make the strategy go almost “all in”. If you head to the docs and take a look at the available sizers, you might see the PercentSizerand think it is the right (wo)man for the job. So let’s take a look at what happens when we add one. 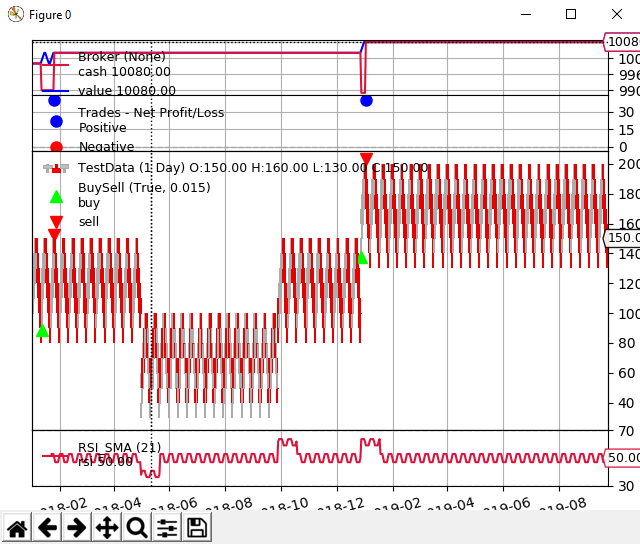 Now we are about to use a percentage based sizer, it would be a good time to show an example of the gapping issue that can arise when going fully “all in”. As mentioned, with this setup, we run the risk of missing trades. The first example will demonstrate just that. We have simply added a PercentSizer to the script and set percentsto 100. If you run the script and compare the results to the previous version, you will notice that the long market entry order on the 28th Dec 2018 is not completed. This is due to price gapping up. Scroll up to compare to the base strategy. If you reduce percentsto 50 then the trade will re-appear as you will have enough cash in the account to complete the order. In the next PercentSizer example, we have moved some of the entry/exit dates in the script. Therefore, be sure to copy the updated code below. This has been done to avoid the huge gap and set a more reasonable percentage level. Of course, what is reasonable depends on what time-frame and asset class you are looking at. For example, if you are on the minute chart for a Forex pair you could probably go almost “all in” with only a very small amount reserved to cover gapping. Conversely, if you are trading equities on the daily time-frame, gapping can be much more extreme! If you read over the code, you will see thatpercentshas now been set to 80. However, if you run the script and take a look at the output. We can see that something is not quite right with the size of the order when attempting to reverse a position. Ok, so the built-in percent sizer doesn’t meet our objectives out of the box. Fortunately, Backtrader has many features and options available to us if we dig around the documentation. One such option is to use target order. A target order allows you to specify a target size, value or percentage of cash to use for the final position. The key difference with a normal buy()or sell()order is that if you are in a position, it will adjust the size accordingly to close the existing position and finish with the correct target size. Official docs are here: https://www.backtrader.com/docu/order_target/order_target.html After reading the docs, the most relevant target order for our goal is order_target_percent. This also happens to be the order target type which has the least information/examples in the documentation. (If you are wondering, how to specify a short position, we just put a negative target percent. Even though to some it might seem unintuitive to target using minus 90% of your cash, it actually follows the same convention as size and value and keeps things consistent. ) The following example is split into two parts. First we will take a look at what happens when you just use target orders to simply replace the self.buy()and self.sell()calls. Then we will finally we will provide a complete working example. As the heading suggests, in the first example we shall just simply replace our buy()and sell()market orders with a call to order_target_percent()and see what happens. If we look at the output and, we can see that we are reversing positions nicely! However, if we take a closer look at the output we can see something is not quite right. 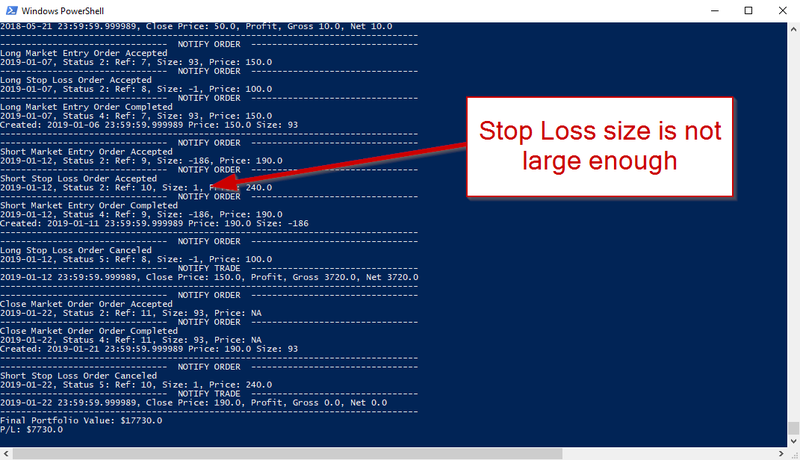 Our stop loss size is incorrect! Without using a sizer, the default size for a buy() or sell()order is 1. As such, this means we need to make one more adjustment to finish things off. 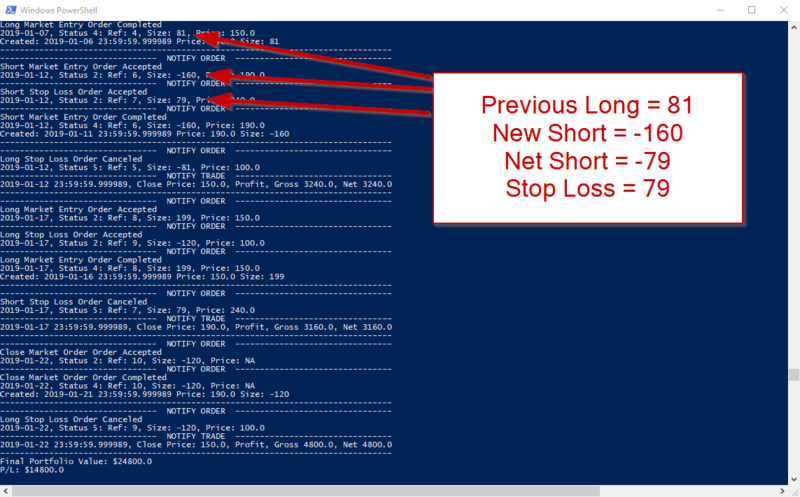 Moving into the final example, we now just need to make sure we set our stop loss size correctly. Initially, the problem may seem complex because we need to be flexible and account for times when we both reverse position and times where we open a position from flat (0). However, there is a simple solution: stop_size = abs(sell_ord.size) - abs(self.position.size) We just take the size from the order object returned when we create a order_target_percent() order. We then simply deduct the current position size from it. If we are flat, we will be deducting 0and therefore, the size will be the same as the entry size. Conversely, if we are reversing, we deduct the current position size, which will result in the same real size of the new position. If we review the final output, we can see that the stop loss size is set correctly. And on the chart, we can see all positions are executed. If this post saved you time and effort, please consider donating a coffee to support the site! Dontate with PayPal using any payment method you are comfortable with. Thanks for your post!! I’m actually working on this right now! Why are you not using the bracket order functionality built into bt (https://www.backtrader.com/blog/posts/2017-04-01-bracket/bracket.html) . Or how could we combine some of these techniques with bracket orders? This promotes bad coding practices. Very messy bit of code, can’t follow what is happening in the code or in the tutorial. Perhaps you want to elaborate on the bad coding practices so that the rest of us Rookies can all learn from your experience? We are all here to learn. Admittedly, some syntax highlighting and a bit more whitespace would be helpful for this post. Generally, the aim of the code on this site is to be functional rather than elegant or condensed. Beginners can often find it hard to read if code uses too many advanced techniques. As such, repetition is not frowned upon here and there is not a quest to reduce the code to as few lines as possible. Of course, you will disagree with this but it is hard to please everyone.